I have not managed to sample many brews from the Canadian Dieu Du Ciel Brewery but those that I have were complex and enjoyable. To add to their creative brews they tend to have mythical and magical themed labels that depict nature and fantasy and this bottle surely emphasizes this with one intense portrait. 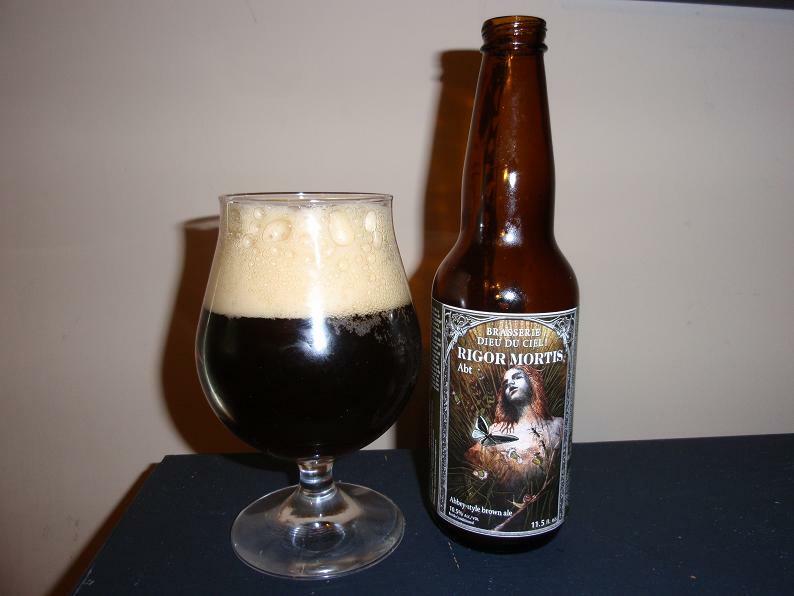 Rigor Mortis ABT is a Quadrupel that is inspired by the strong brown ales brewed by Trappist monks. This ale pours a very dark brownish amber hue that appears black from a distance but a rich dark amber when brought to light. The head of this opaque brew is a fluffy off white hue and consists of tight bubbles that open up quickly but last for many minutes and retains a small puddle on the surface almost indefinitely along with some nice lacing. Aroma is quite nice. Malt aromas are dominate but not overly sweet and actually quite dry. 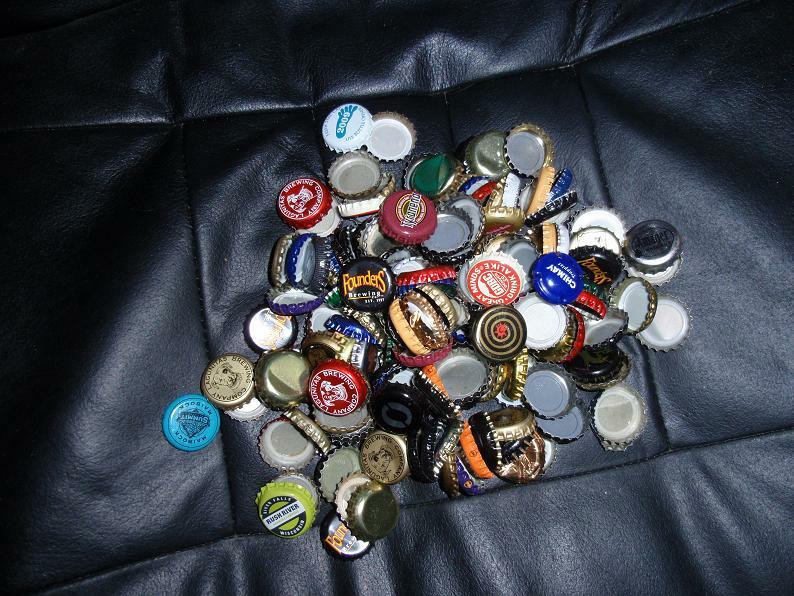 Alcohol comes in and out but is not particularly strong considering its 10.5% ABV. Decent bitterness is present but seems to be coming more from dark malts than hops. Everything from dark fruit to coffee to tobacco are present in the aroma of this beer but all are amazingly subtle and balance off one another quite well. Additionally yeast notes are very dull but still add an additional herbal component. 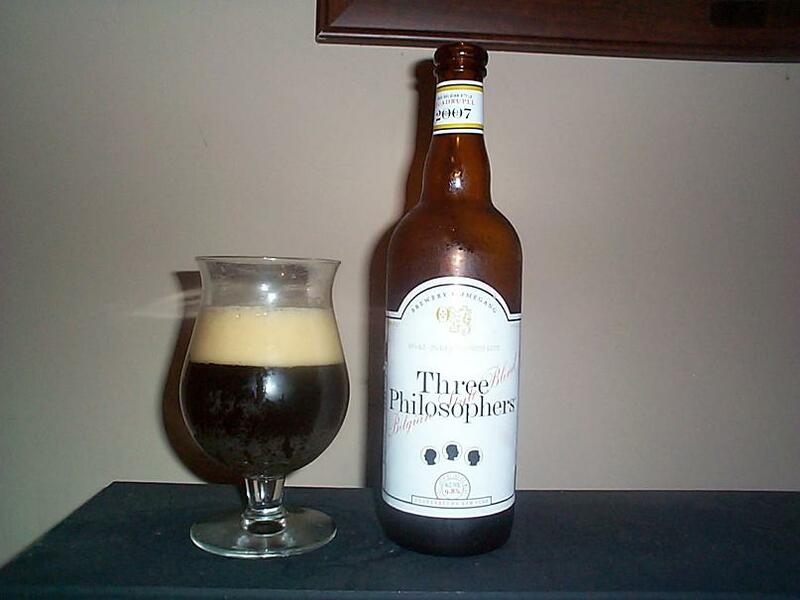 Tastes largely of gentle dark pitted fruit, clean malty sweetness, a hint of caramel and a gentle dose of alcohol. I find the flavor of this brew incredibly interesting. On one hand I am a bit surprised there are not more distinct flavors playing off one another as one will often find in many Belgian Strong Ales, particularly Trappist Ales. However at the same time there is something quite enjoyable and comforting about the basic flavors present and the power of simplicity. The mouthfeel of this brew is well carbonated and somewhat creamy yet quite clean. Body is a bit heavy but appropriate for the style. Less yeasty than I would expect for a Trappist inspired brew but likely more similar to traditional Abbey Ales of the past, if only I could go back in time. If you enjoy Strong Belgian Style Ales you will most definitely enjoy this simple yet delicious brew. As far as food pairings are concerned I think this beer might actually be an amazing candidate as it will not overpower the flavors of your food yet cleanse the palate wonderfully. Give it a shot and ride your bike. Victory Brewing out of Downingtown, PA make a myriad of delicious brews and have apparently created a number of “Vintage-dated” brews over the years that have been released to limited markets. 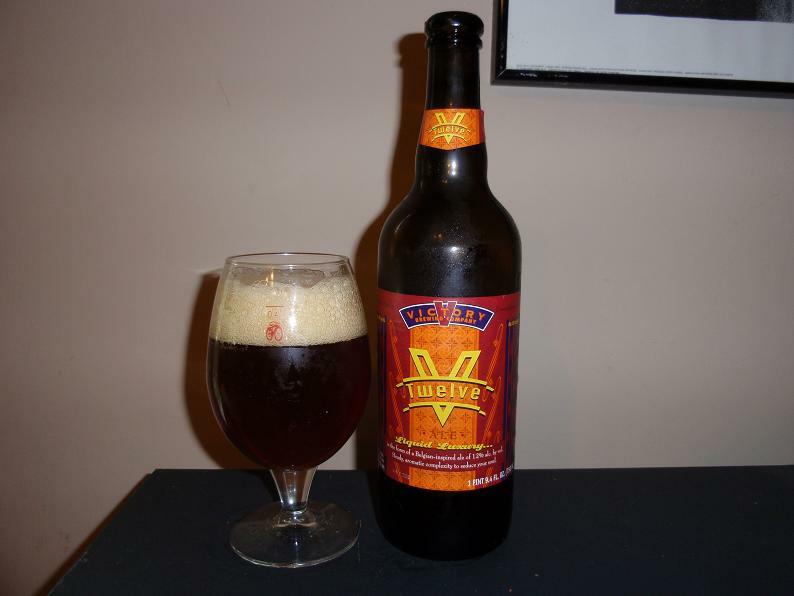 Today I have the opportunity to sample their V-Twelve a Belgian Style Ale which I found at The Four Firkins last month. With a 12% ABV this is sure to be a serious beer, let’s see how it goes. As soon as I popped this 750ml open deliciously sweet fruity aromas came to me. Pouring straight down the glass yielded a modest two fingers of loose off white head that faded with in two minutes or less leaving some small bubbles around the surface of the beer. Color is an attractive cherry red that is relatively opaque, only becoming somewhat translucent when brought to direct light. Aroma contains a good deal of dark pitted fruit, plum and cherry strike me most. In addition to a bit of carbonation, malty sweetness and some alcohol though less than I expected with its ABV. Flavor is quite interesting pitted fruit notes particularly date, plum and cherry come across first and are accompanied by a nice level of malty sweetness followed by an almost smokey characteristic all of which cover the alcohol content marvelously. Body is medium or more but the clean mouthfeel makes this brew feel quite light. As this brew warms the fruit notes become ever more and more dominate and sweet emphasizing the cherry flavors with a gentle alcoholic note in the end that further enunciates the soft bitter notes creating an enjoyable finish. They suggest consuming this beer at around 45 degrees Ferinheight, of course in the proper open tulip like glass. I traditionally consume most of my beer around this temperature, leaving a bottle out for 20-30 minutes before consuming it but with the temperature as warm as it is in yes, Minnesota this time of year I have been much more lenient as of late simply because of how quickly the brew tends to warm up in my glass. With that said I would highly suggest consuming this beer at its proper temperature as the flavors become so much more clean and noticeable, though of course that includes the alcohol notes. Unquestionably a solid Belgian influenced amber brew that will be enjoyed by anyone who doesn’t oppose sweet malty pitted fruit notes and a good does of alcohol. If you can still find it, give it a shot and ride your bike.